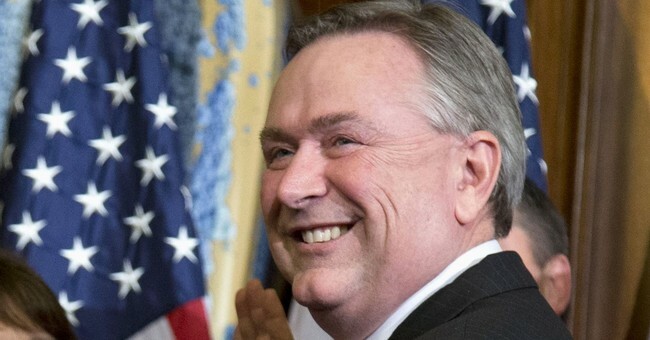 Democrats are gloating over the sentencing of former Rep. Steve Stockman (R-Texas) last week. He was ordered to serve 10 years in prison for the vague charges of mail fraud, wire fraud and money laundering. Whenever prosecutors want to get someone who hasn’t actually committed a crime, they use those vague but scary sounding charges. He was also ordered to pay $1,014,718.51 in restitution, to be divided between him and two other co-defendants. What did Stockman actually do to warrant this? He facilitated four donations from two donors totaling $915,000 to two nonprofits he was associated with. One of the nonprofits spent some of the money on a campaign mailer showing the differences between Stockman and the senator he was running against. It is a (c)4 and its purpose was to educate voters. The mailer did not endorse Stockman or tell people how to vote, so it did not run afoul of campaign laws. The donors were fine with how their money was used, which was mostly for youth education. Stockman believes he was targeted because of his conservative activism. He was known for boldly opposing President Obama. He was a Congressional whistleblower on Obama administration corruption, with such actions as calling for the House Select Committee to investigate the government's handling of the Benghazi embassy tragedy of lost American lives, exposing President Obama’s payment to the Haqqani terrorist network in exchange for the release of Army deserter Bowe Bergdahl, and revealing Secretary of State Hillary Clinton’s violation of the Iran sanctions to allow the sale to Iran of specialized steel used in nuclear weaponry. The DOJ is full of deep state operatives. They have continued conducting political witch hunts against vocal conservatives under the Trump administration. Former Attorney General Jeff Sessions did nothing to stop it. The deep state went after Stockman hard because he was a threat. They wanted to silence him and make an example out of him, so others would be hesitant to follow in his footsteps. Sadly, most of the conservative media hasn’t reported on this corruption. They are running articles that rubber stamp the press releases from the DOJ. The press release announcing the sentencing is filled with errors and lies. For example, it says that "Stockman failed to pay taxes on any of the $1,250,571.65 in fraudulently acquired donations." Well, only a slim portion of those donations made their way into Stockman's personal accounts — what he was paid before he ever took office. And taxes were paid on that income. U.S. Judge Lee H. Rosenthal appeared to be biased against Stockman throughout the trial. She fell asleep several times and reportedly is friends with Stockman’s opponent. Wetmore observed, “At one point, during an argument I was presenting to her in court, she was making obvious non-verbal cues such as rolling her eyes and laughing at my argument quietly, just feet away from me.” After she announced the sentence, she sarcastically said, “That’s a long time, but Mr. Stockman, I think you earned it.” Stockman intends to appeal.